Introducing The Urban Cultivator Commercial! The Urban Cultivator Commercial gives you the ability to provide the freshest herbs and greens possible for your customers. Designed to accept the flats of herbs you already receive from your supplier, keeping your herbs and greens growing until the minute they are needed. The Urban Cultivator Commercial is the only appliance on the market that allows you to go from harvest to plating in seconds. With the ability to grow up to 16 lush trays of fresh microgreens, vegetables, and herbs, it demonstrates you and your restaurant’s commitment to real, healthy, and organic food. From komatsuna to basil, the seasons won’t have a say in what you can grow anymore thanks to the Urban Cultivator Commercial’s automated lighting, watering, and temperature controls. You can grow it all 365 days a year. 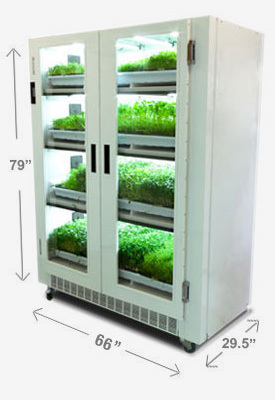 In addition to having access to the absolute freshest food for your dishes, you can also save up to 90% on produce through growing your own herbs, microgreens, and vegetables in an Urban Cultivator Commercial. The average price for a flat of microgreens in most cities is roughly $15. The same greens grown in an Urban Cultivator Commercial—stronger, more flavorful, and healthier due to the fact that you’re harvesting seconds before serving it—costs only $4. With health and sustainable food practices as some of the most important things in today’s culinary world, now is the best time to grow your own greens in an Urban Cultivator Commercial. Learn more about the Urban Cultivator Commercial today. Start saving on greens today! Grow and serve the freshest greens grown in your own kitchen for a fraction of the price of buying wholesale. Interested in learning more? Fill out your information and get a quote.